Intro from Jay Allison: Zak Rosen is a radio producer. Neil Greenberg is a map-maker. They're both from Detroit, but their hearts are in a different city, a city they think is possible--at least in the imagination and maybe in reality. The radio piece they made together treats this place as if it were real. It is a creative exercise that hints at a plausible future. Fake City, Real Dreams is unlike any "arts feature" you've heard before. 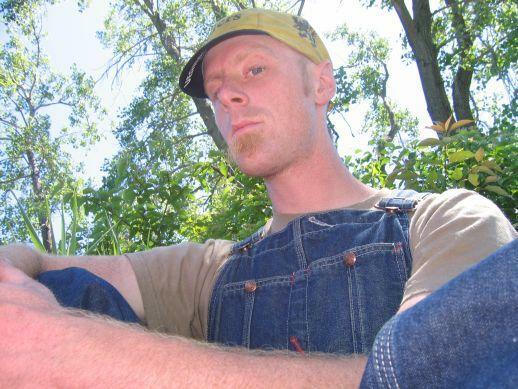 About a year ago, a neighbor of mine told me about this guy Neil’s fake place project. 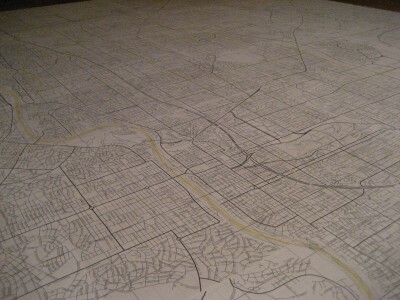 She said that he was mapping a really expansive, detailed metro region on 17, huge poster boards. I was intrigued. I had heard Neil’s name several times before but hadn’t yet met him. Then finally he and I were introduced through mutual friends on a Saturday morning at Eastern Market, one of Detroit’s weekly farmers markets. I expressed interest in doing a story on his project and we exchanged numbers. 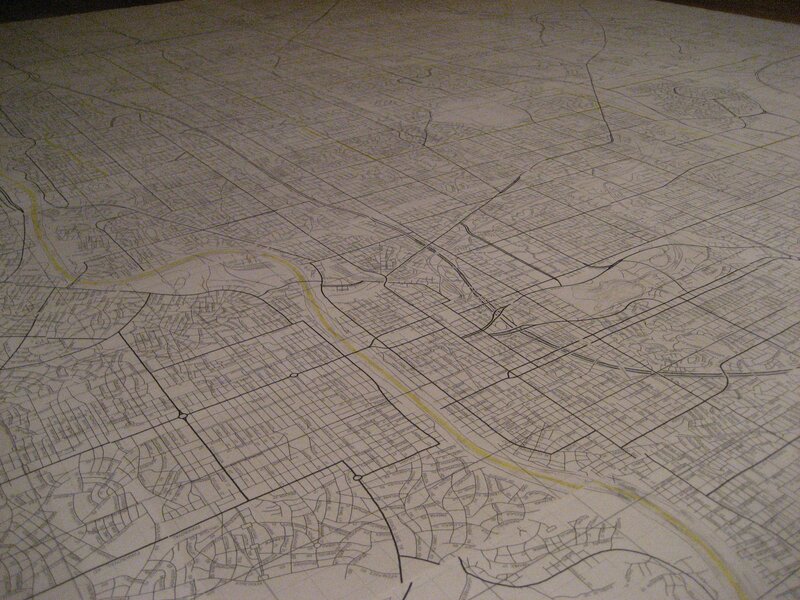 17 posterboard size sheets of paper fit together like a big, geographical puzzle. Neil drew everything by hand. A few months later I went to his apartment to check out the maps and do some recording. I interviewed Neil for about 4-hours (none of that tape made it into the final cut), without really knowing what direction the story would go. All I knew at the time was that Neil’s vision was so inspiring and creative, that a conventional profile piece would NOT do him or his project justice. I understood that though his ideas were really eccentric and quirky, it was, more importantly, grounded in something that could be used for real-life application. After that first night, we started meeting semi-regularly to talk about his fake world. 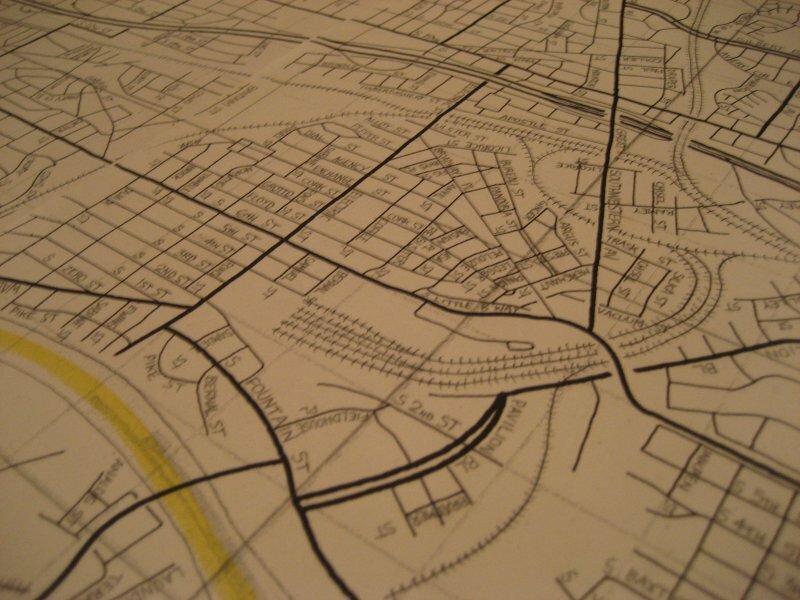 He thought of the maps as a laboratory to work on various planning ideas that could apply to Detroit, or any other city for that matter, without having to deal with the cynicism and bureaucracy we Detroiters can often encounter in the face of meaningful change. At some point I thought about how cool it might be to climb into Neil’s head, to get an idea of what he sees when he looks at his maps. Point to any area or intersection and Neil will seamlessly delve into the history of that block, that neighborhood, that business district, etc. It’s really amazing. None of the narratives that he so easily accesses in conversation are written down. It’s all in his head, working itself out as this organic, living thing. In doing additional interviews with Neil, I’d ask him questions like, “What’s the mayor of this place like?” Then he’d spout off this really fiery monologue about Vanessa Nawinn, the half Vietnamese/half Nicaraguan mayor who showed the people of his fake-region that you don’t have to be old and white to lead a metropolitan area (of course there are exceptions to that truism, like Detroit’s embattled Mayor Kwame Kilpatrick). He spoke of Mayor Nawinn as if she existed. As if they were good friends who hung out after work. Neil expressed that he wanted to get other people involved with the project, people whose area of expertise could expand the scope of the map, and city. Neil’s a transit guy. I’d say he’s obsessed with it, but he’ll readily admit that he’s no expert on transforming an urban education system, or figuring out why gardening can be used to nurture an area or a people. So we set-out to interview a few Detroiter’s who we knew devoted a lot of time and energy to working towards, and thinking about, different paradigms in their own respective lives. We asked them to think about what they would like to see happen in Detroit in the next 15 years in terms of education, politics, community building, etc. And we asked them to answer the question of what the future could be, in the present tense. In other words, their dreams for a different future became their present reality. Instead of saying, “Detroit could really use better cooperation between bikers and businesses,” it became, “Ever since the city (there are no allusions to any specific place) started meeting with different merchants to determine where bike parking should be…the merchants realized that cyclists exists as a potential market and customer base.” Neil always talks about how easy it is to bad mouth the city, or talk about a goal without really thinking about how to get there. So with his project and my audio component, we aimed at illustrating some real big dreams, but supplementing them with a sensible path towards achieving them. The bits about cycling, education, and work/gardening feature Detroiters Jack Vandyke, Mindy Nathan, and Grace Lee Boggs, respectively. My colleague, Amanda Le Claire, played Mayor Nawinn. Another colleague, Monica Issac, played Dina, the single mother. They both did this by reading a script I wrote based on interviews with Neil. I did a lot of the pre-production, conceptual work by bouncing ideas back and forth with sound artist/documentarian, Victoria Fenner. We got hooked up through AIRs mentorship program (sign up today!). Then I recorded a lot of Detroit sounds, and got some additional sounds off Freesound.org, and transplanted them into the mix. Because the world is fictional, I gave myself license to go back and re-voice my questions/responses to Neil when needed. The idea was to make it sound like he was giving me a tour of the place, telling me about it for the first time. After asking Jay if he could help me with the post-production, he invited me to his neck of the woods (get it?) to do the final mix. Having him there to critique my tracking and editing choices was really invaluable. It was also really nice to be working on the story without having to think about anything else for those three days in Woods Hole. In the end, I hope the piece kindly reminds Detroiters (or anyone living in a place they love) to continue their work towards re-visioning the city they know can exist (and does in certain areas). As Neil says at the end of the piece, he knows this project isn’t going to be the exact script that will bring Detroit into a new era, he just hopes it will convey the message that it is possible to talk about the future, in a realistic and meaningful way, without getting frustrated with our present. I want to also thank my girlfriend Shira, the entire Smitten Mitten Radio Collective + David Schulman for critiquing early versions of the piece while openly embracing them too. I recorded a lot of the interviews and sounds on a Marantz PMD 660 with an Electrovoice RE50. Some interviews we’re also done at WDET’s studio. I did some additional tracking with Jay’s really nice Schoeps microphone. The effect on the Mayor that made her sound like she was talking into a big speaker system was made using “SpeakerPhone.” I mixed it all on Samplitude. Neil and Zak this is lovely and super cool. I’m currently living in a very small town and love the idea of bring the best of rural life to the big city. I hope your fake city leads to more than dreams. Thanks for listening and getting this forum going. Exploring the post American landscape"
its population and economy decline." You can read all about Detroit and it’s fragmented embrace of small-scale, green living in the article. Thanks for this great piece. I love the concept– I’ve daydreamed of doing some sort of audio mapping documentary for a while, and it was interesting to see you playing with a similar concept in this story. I’ve also forwarded this to a friend in the bike planning community, and would be interested to read her feedback on this as well. With such a huge potential field of characters, stories, and intersections in this "fake" city, I’d be interested to hear from both of you about where you got started– both in imagining this world, and in documenting it. Zak, since this originally came from a very visual inspiration (the maps), I’m wondering what it was like as an audio producer to try to translate this story into sound. Do you feel like anything was lost, or gained, in that process? Neil, I must confess that I’m not a gamer or tekkie– but I wondered if your process for designing the city was informed at all by things like SimCity or Second Life. 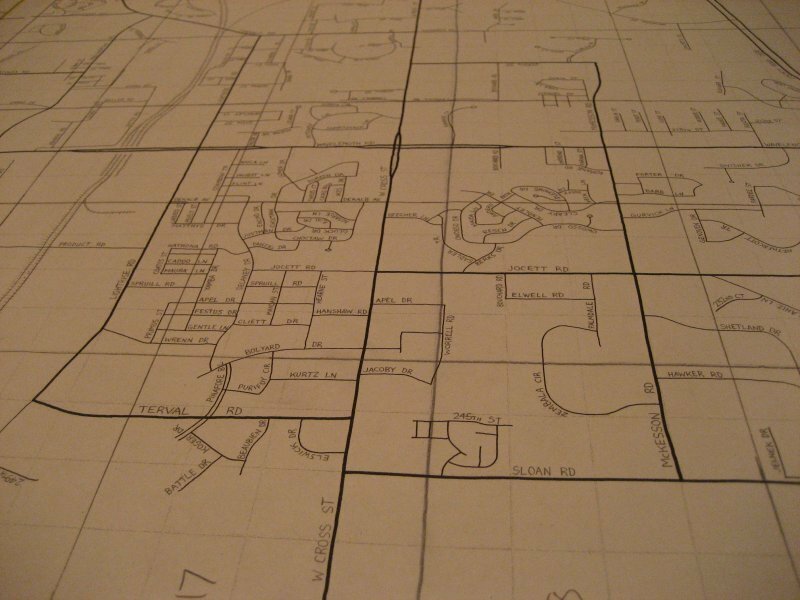 Are there ways that having a physical, paper map shape that process differently than digital-only imaginings? The piece mentioned that every city and community has its problems; yet most of the interviews and descriptions sounded almost utopian (bike lanes, community gardens, and a 28-year-old woman of color as the mayor.) I’m wondering if there are other complexities or shadow sides to the city that perhaps you didn’t have time to get into? Also, I’m wondering if you have hopes about how this "fake city" could shape the "real dreams" of actual cities? Thanks for a thought-provoking piece of work! Would be interested in all the answers to Elizabeth’s excellent questions. Found the piece uplifting…especially at this dire time for so many cities, and, well, all of us! The timing also wildly poignant in that the real mayor finally got outta the chair, so to speak. Neil, do you wish you lived in your map? In a way, you do, I guess. But is reality a bummer or simply more material to transform into inspiration in your alternate universe. Where would you both want this piece to be heard to be most useful? I think schools would be a great place for starters. Thanks for the very creative way you both brought us to share in the map. Hey E!, Thanks for listening and for these thoughtful questions. "I’d be interested to hear from both of you about where you got started– both in imagining this world, and in documenting it." "Zak, since this originally came from a very visual inspiration (the maps), I’m wondering what it was like as an audio producer to try to translate this story into sound. Do you feel like anything was lost, or gained, in that process?" Yeah, I feel like the amazing amount of detail in the maps was lost in the audio. Neil thrives in detail and nuance, and the fact that we only heard from 5 people/charecters in a city built for more than a million seemed to make the place feel smaller. I feel like my piece was more an interpretation of Neil’s idea, rather than a document of it. The interviews we hear in the piece were done for the sake of the audio. I think (Neil correct me if I’m wrong) that w/o the audio piece, Neil would NOT have gotten perspectives from Jack, Mindy, and Elder Elder (Grace). The maps are really expansive and dense. Looking at them is just like looking at any other map. So I think the audio component added some intimacy and personality to the maps that are seemingly less personal. 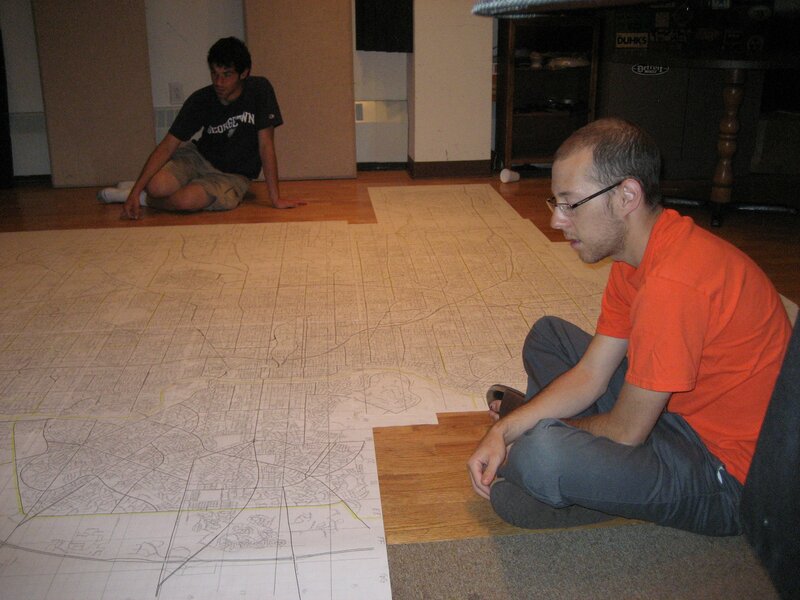 However, I have a much different relationship to maps than Neil. When I look at a map, I see symbols, and confusion. I think Neil sees life and stories and people. "The piece mentioned that every city and community has its problems; yet most of the interviews and descriptions sounded almost utopian (bike lanes, community gardens, and a 28-year-old woman of color as the mayor.) I’m wondering if there are other complexities or shadow sides to the city that perhaps you didn’t have time to get into?" "Also, I’m wondering if you have hopes about how this "fake city" could shape the "real dreams" of actual cities?" I think the fact that we didn’t allude to any real city (except at the beginning), the piece lends itself well to play really anywhere. I think that seeing the detail of the maps is super important though. Neil has taught me that it’s easy to have ideas, but detailing a path to solutions is the hard part. So I think the dream-like nature of the audio, along with the nuts and bolts of the maps (along with Neil’s explanation of them) can work well, hand in hand, to inspire realistic dreaming in anyone. We’re actually going to air the piece here at Detroit Public Radio tomorrow morning on the local affairs show I produce (http://www.detroittoday.org). We’ll listen to the piece and then have a panel discussion about city making with Neil, and two other people working on similar but differant projects locally. This is so interesting. As someone very interested in space vs. place, mapping and audio work, this piece was extraordinarily thought-provoking. Thanks for this! I linked it to my personal blog. Fake City, Real Dreams is a delightfully creative journey that moves between a fictitious world and a discussion about what and why that world is. The transitions between the characters of the world and the exchanges between you two are smooth and effortless. The overall effect leaves me feeling as though Im being led on a tour of both a geographic place and an imaginative destination, and that my guides are both city planners and conjurers. The soundscape is really nice and the music helps guide the transitions and sustain the often dream-like quality of the piece. Details like the bicyclist calling out turning left and the mayor being half-Vietnamese and half-Nicaraguan (and only 28!) are well placed and contribute a sense of authentic texture. My only constructive criticism concerns the exchange between Neil and Dina. It feels like theyre talking too much on top of one another, even though I understand that I should have the sense that theyre telling the narrative in parallel. What parts about this project were especially challenging? Was your sense of the flow of the piece clear from the beginning? This fictitious place is a place I want to believe exists. I like how Elder Elder says that theyre becoming more human again in this city  through smarter transportation, through civic responsibility and collective action. Storytelling makes us more human again too. 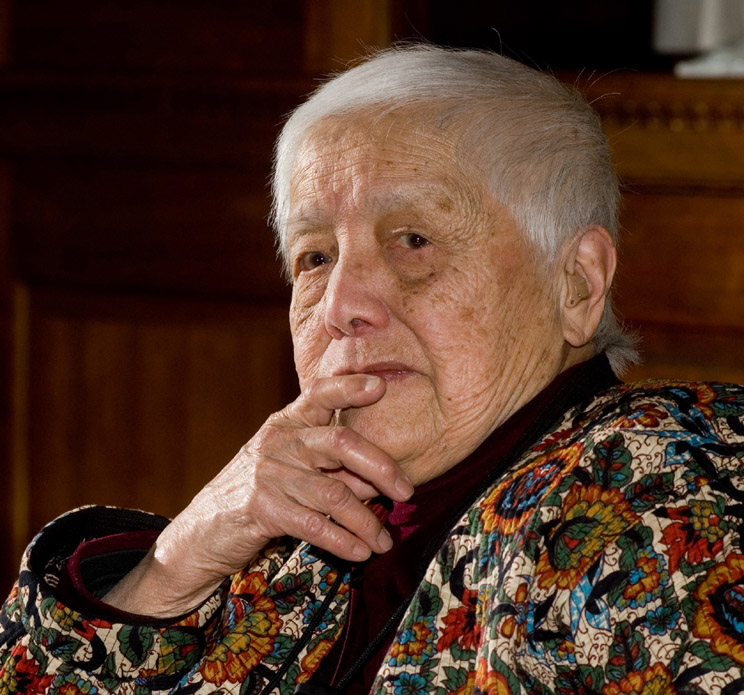 So I think it especially effective how you two tell us stories about this other world, connecting us to our neighbors and communities, both imagined and real. Thank you both for a great piece! Thanks for your thoughtful response. I absolutely played SimCity as a kid — first, the legendary original on my ol’ 286. Then, the more advanced SimCity 2000 later on. My early love for cities brought me to those games, not so much the other way around. Those are great games, but I felt confined by some of their physical limitations. A low-tech approach — pencil and paper — let me do exactly what I wanted. The roads and landmarks didn’t have to fit neatly into squares. Plus, the absense of a pre-drawn features let me imagine my own places. Oddly enough, I’m now trying to digitize certain parts of the project. Since I have the hand-drawn map mostly done, I can plot it into a digital illustration program and take things even further. If you’d like to read more about the less "utopian" aspects of the project, my bud Rob Goodspeed interviewed me extensively: check it out at http://www.goodspeedupdate.com/2007/2169/ . To borrow a passage from that interview, none of this "just happened". Each layer involves less-than-ideal circumstances, strong opposition, and complex challenges. The idea is not to ram through major changes in an easy environment. Its about proving the need for change in a climate adverse to it. It’s about understanding the small steps that eventually add up to big strides. Its about taking a tiny leap of faith, and imagining what would happen if the ball started rolling. Thanks for your thoughts. Any more discussion gladly entertained! Sydney… in truth, I think about my city all the time. ALL the time. Today, for instance, I had an hour to kill at Macomb Community College in Warren, MI (real life). Rather than stand on 12 Mile Rd, waiting listlessly for my bus, I took a walk around the campus. The whole time, I was imagining Hastings County Community College-Morningstar Campus (on my map). I was thinking especially about the transit routes that serve the college. That’s where my mind was. My mental image drew from where I actually was, mixed with a few other small college campuses I had visited. Reality is kind of a bummer, at least given the current state my real-life surroundings. Not to say "my life is miserable!" — it’s not — but sometimes, I’d really, really like to go to my city. It’s not utopia. It rains, people frown, buses run late, but it’s a generally happier, more exciting environment than my reality. As Elizabeth noted, part of my map is the challenges themselves. The map doesn’t so much depict an ideal place as it does a changing place. But instead of fearing change and predicting the worst, we embrace change and work it to our benefit. If anything, that’s the gap I’d like to bridge most. Maybe I can talk Zak into doing an "extended" version, detailing more of the challenges encountered. In that case, a good audience might be politicians and community activists. As you note, schools would be a great place to air such a project. so good, i want to move there. This piece and the project are an inspiration – especially around this election year and talk of change. Thanks to both you of you for presenting it in your own ways. Niel, I am wondering what it was like for you to document these maps in an audible way. Did a script and actual characters seem accurate to your vision of the place? Does it feed your mapping? Have any new neighborhoods developed since the community members and neighbors themselves have spoken? And to you as well, Zak – did you 2 work together on this script and development of characters or was it rather a presentation of already developed people? I’m wondering how much the characters morphed when they became not just neighbors in Niel’s heads but voices as well. Thanks again. I thoroughly enjoyed it! To answer your question, Sara, "did you 2 work together on this script and development of characters or was it rather a presentation of already developed people?" It was important for me to make their interviews sound real, but not too real. I wanted to keep injected in their a sense of dream-like quality to their perspective. That’s why we asked them to step out of Detroit, and in their mind, become residents of Fake City, you know. We would say things like, "forget about the situation the public schools are in right now (in real life)." Instead talk about the system as if you have the ability to make real changes to it, and act as if those changes were made 15 years ago… And today, the system is far from perfect, but very very far from broken. The Mayor and Dina read from a script I prepared based on interviews with Neil. Zak and Neil: I loved hearing this piece. Its not merely about the impulse to re-imagine the world, but itself embodies that impulse in its very fabric. There are so many more conventional ways you could have approached this story, but none would have drawn us in, in such a magical and unpredictable and memorable a way. ZakSince you had to invent a form for this story, what do you feel you discovered or unearthed as a way of working or putting a piece together? Neil- Your energy is so buoyant and comes through in the piece so clearly. Im curious about whether experiencing your vision in this audio form gave you some unexpected insight? Is there anything you discovered in this process? In editing this piece, we were always grappling with questions like, "Will people understand this?" and "Does it matter?" Because the various levels of reality and imagination are intertwined, we were worried people would give up, feel lost, with no map. So, we tried to put up enough road signs that even though the narrative pathway was unfamiliar, you’d still see the signs occasionally and know you were on the right track. But did it work? Were you bothered by questions without answers to the degree it inhibited listening? Stephanie, to answer your question "Since you had to invent a form for this story, what do you feel you discovered or unearthed as a way of working or putting a piece together?" I think the main thing, basically, was to honor Neil’s creativity. The piece couldn’t have just been a profile. I know it’s pretty basic to say, but I learned (maybe re-learned), that a piece doesn’t have to have any ridged boundaries. Just as long as it made a certain sense, or achieved its own internal logic, it would be worthwhile. I think the other thing that I learned (because I wasn’t working against a deadline), was that it takes time to develop an idea. I was befuddled for several months about how to frame the piece, and then, little by little, it started to make sense in my head. And then having Jay, and Victoria Fenner as sounding boards helped instill a certain confidence in me that the piece wasnt too weird to pursue. This is a very interesting piece and I like the way it blends documentary and fiction in really great ways — both within the body of the piece (real people taking on fictional roles) and the overall documentary structure (a fake city with real problems). Jay, in answer to your questions, I think I would have liked to be even MORE immersed in Neil’s world. Zak and Neil are always sort of standing outside the Fake City giving us commentary and explaining things and I would have liked less of that, more of the real (the real Fake City, I mean). If anything, I got a little "whiplashed" going in and coming out of the Fake City — being immersed and then taking a step back to explain it. The way I see it, there’s no way a story like this is ever going to get to market, so you’re free to really go for it! You might as well burn all the conventions down! Ha ha ha. Thanks for making the piece. I really enjoyed listening to it. I really enjoyed that you made parts out of what you had, and made up the other things you needed as you went exploring into a territory (of audio work) thats not often explored. All creating is a feat of imagination, and I think the best thing that Zak and Neil accomplished with this collaboration (between themselves and others) was making a profile of what it means, and what it feels like to havenot just imaginationbut also vision. Inspiring listening, in many ways. Great to see other people taking the time to make what holds meaning for them creativelywithout worrying too much about where it ultimately leads them. This is such a rich piece, both in its conception and execution. I will admit to being a little confused upon first listen — I purposely avoided reading Zak’s explanation until after hearing it — and wasn’t entirely sure why people were speaking in the present tense, as if they were part of a city that didn’t exist. Perhaps that aspect of the production could have been explained in a little more detail, as in, "They’re going to be saying this, but what they’re really talking about is this." I also wondered whether a piece like this would get aired, but upon 2nd listen found myself marveling at the ingenuity here. What a gamble, and what rewards the dedicated listener reaps. Any thoughts about a follow-up (or heck, even a series) in which you take real-life urban issues and try to solve them, in depth, in Neil’s city? As for a follow-up, there aren’t plans for one, but I wouldn’t rule it out. There are so many components that we missed. It would be great to talk to a real estate developer, shopkeeper, woodworker, etc… in fake city. But at this point, I wanna get back to the reality of where we are in Detroit today. There are so many stories that I feel need to be told here right now, many of which are filled with hope, wonder, and ingenuity. Here are some worthwhile links that have got me excited. "Each layer involves less-than-ideal circumstances, strong opposition, and complex challenges." Neil’s quote seems to capture the essence of his map, Zak’s audio piece, and Detroit itself. A motor city native as well, I have on occasion (usually after a few beers) elected myself Hypothetical Mayor of Detroit and pontificated wildly on the topic of What Detroit Needs. But it’s hard to come up with even imaginary answers that seem viable– which is why I love the idea of of *starting* from utopia and moving backwards through the details. I love the idea of using a project like this a tool for actual change. I’m wondering what kind of response you guys got after the piece aired on WDET? Have you been able to present it in other public settings? Hey Melissa, here are some responses to the piece from our daily show’s blog. 1) "Zak and Neil need to get a life..Please enough of the pedestrian and impotent visons and imaginations of these 2 shallow vessels.. This was not an excercise in creativity or a cutting edge arts feature.. This was impotent ego driven display of how weak and empty ideas get funded by reasons unk to mankind..
Our region cannot be this uninspired and void of talent..I hope I am wrong..I really do.."
3) This piece was fantastic! The underlying message of doing it – doing anything – regardless of the carping and piddling of doubters, is THE critical attitude needed. No one els is going to clean up this mess, but us. Now, build that city out of Legos. I’m not kidding. 4) Absolutely a great episode, regardless of applicable it may be. 5) The "map" piece was akin to listening to Fantacy Football Fans planning for the Lions trip to the Super Bowl. A waste of electricity. I’ll send you a bill for the time I spent listening. 6) wow, i can’t believe how many Detroiters can’t see a highly creative and experimental piece of work when they see it. Bill, people like you are the reason the Heidelberg Project was partially bulldozed. Get a life. 7) What a worthless excercise in imagination by Zak and Neil. SOme Miles davis or John Lennon for an hour would have been more impactful than the musings of the inflated nonsense of these frauds.. There was nothing cutting edge nor experimental about this garbage but the selfishness of inflated ego’s who need some sleep..
8) I just finished listening to the Fake City piece and while it certainly doesn’t mark the return of Mercury Theatre or a Glen Gould radio essay it still was a decent work. Maybe more of a cross between Prarie Home Companion, The Matrix, and the cheesy envisionings of Richard Florida and the whole creative class crowd (the elder elder character, yikes), all it needed was Lady Aberlain from Mr. Rogers Neighborhood, (Where was the trolly?). But still it was entertaining and a good listen. I look forword to another speculative piece. How about a digital detroit today with Chris, Amanda, and Zak avatars ? As for other public settings for the piece. There’s an exhibitions gallery in Midtown, Detroit (right across from where Neil lives and a few blocks from WDET) that shows a lot of community-based work. I emailed the director the other day thinking that Neil’s maps displayed in full along with a listening session of the piece could be really interesting and fun. We’re also planning on re-purposing the piece for "State of the Re:Union", Al Letson’s new show that I’m helping out with. hmmm….well. You see why we need optimists. 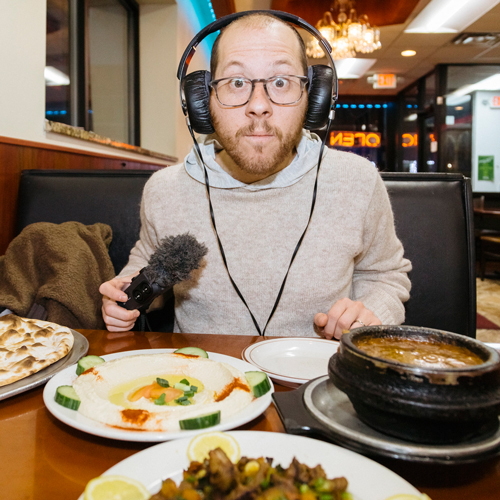 why is so much public radio so dull? I finally got to listen to zak and neil’s weird and wonderful piece on this rainy afternoon. congrats to everyone involved on a really thought-provoking work … the only real downside is that listening to something like this makes me realize how rarely any of us get to take any risks on pieces, how good some producers would get if they were given consistent support and could just run with their ideas and curiosity — and, in comparison, how absolutely unimaginative and boring most mainstream public radio is these days. good on you! and to jay, too, for supporting you on this. it’s heartening to know stuff like this is in the ether. I was at the DIA and caught your show, it was GREAT! Can you add a Cultural District? Bicycle lanes that promote sociality and a local music store’s business, a 28-year-old half-Vietnamese-, half-Nicaraguan- American mayor who uses words like "metaphor" while cutting the ribbon on a new bridge, an elementary school that gets empowered while learning how to recycle. "Q: How are they doing on standardized tests? A: They do ok, but the important thing is they’re learning to think." My goodness, enough already! I can’t take it anymore. My progressive index is off the register. And I’m smiling the entire time. I listened to this while walking to work in my own city, rolling my eyes fondly at yet another progressive fantasy brought to life by Zak’s inspired storytelling. The piece’s production style creates a sense of place as much as the content does. In a way it reminded me of the film Russian Ark, the way it moved from ‘room’ to ‘room’. Or maybe now I’m going over the top, too. Love the music you use, too (e.g. Tin Hat Trio). The only challenge for the listener is knowing just when we’re in fantasy mode, and just when the narrators have stepped out of it for a minute. But I will be generous and say it could be deliberately in support of the dream/reality blur that makes this so fun. At the dawn of a new federal government that might actually generate *real* good news from time to time, this piece has a very relevant place on everyone’s air. i really enjoyed listening to “fake city, real dream”. i volunteer at a free & community based radio in austria. i also try to support community building in the city by radiowork. media as public dialogue und discussion. there is also a project called http://www.iconoclasistas.net/ that responses to peoples common sense of public spaces. may i rebroadcast your show on radio helsinki? as we are free, noncommercial and community based?